Last week, we highlighted Tipton, Indiana which is currently working on an alley project as a placemaking tool in their downtown to make it more inviting. Alleys have historically been places for people and have recently gotten away from that to become a place more for automobiles and trash bins. In this document, entitled Activating Alleys for a Lively City by Mary Fialko and Jennifer Hampton, alleys are treated as potential dynamic spaces in a city or town of any size and the authors describe how this change can occur. These are diagrammed and then specific ways are discussed as to how these types of alleys can be activated and made fore people again. Some of the goals the authors focus on for what alleys should be are: quality of public space, ecological health of the city, and a safer environment for people. These then can be accomplished through design strategies. The authors determined there is a potential of increasing the public space in Seattle by 50% solely by converting alleys into usable public space. Source. Along with attractive drawings, diagrams and charts, the appendix includes a full inventory of 200 alleys in Seattle neighborhoods which is interesting to peruse through! This resource would be great for any community looking to increase their public space in ways other than pocket parks and an excellent placemaking tool! In many circumstances, transportation and placemaking can seem like opposites. Transportation is about cars, buses, and trucks, and getting these from one place to another as quickly as possible. Placemaking is about people first, getting cars, buses, and trucks to slow down and consider the place they are in. How do we get these two fields to work together for a product that is best for the general public? This site is specifically “to introduce creative placemaking to transportation planners, public works agencies and local elected officials who are on the front lines of advancing transportation projects” Source. They also stress how this guide does not have to be read linearly. Each point and case study can be looked over independently of the others and still understood without necessarily going through all the other points in order. If you’re looking for ways to integrate transportation and placemaking, this would be a good start! Another plus is that the picture on the main page is of the Indianapolis Cultural Trail! Visit the site here and find out how your community can better incorporate transportation and placemaking! Did you know there is more than one type of placemaking?! Depending on what you are trying to accomplish and how you are trying to accomplish it, there are different types of placemaking to use. Not only does this document describe each type of placemaking, it also gives lots of helpful diagrams, examples, descriptions, comparison charts, flow charts, and resources for those really interested in the right type of placemaking for themselves and their community! Use this link to get this document and start making places in your community! 33% of Americans are unable to drive a car? Shifting from a long commute to a short walk would make a single person as happy as if he or she had found a new love? Each point increase in walk score (a walkability index) typically increases US house prices by $700-$3,000? The Indianapolis Cultural Trail diverts over 68 million gallons of runoff per year? Every 10 minutes of community cuts community involvement by 10%? Last week, I wrote about a project going on in Gary, Indiana which encourages people to get out and walk around their downtown in order to reinvest in it. This week I’m highlighting a really neat resource which is along the same lines: a comprehensive document about walkability in cities and the plethora of positive effects moving “towards a walking world” can have individually, locally, and globally. Cities Alive: Towards a walking world is an extensive report put together by different parts of the ARUP team in London, with help from other specialists around the world, which details the benefits of walkable cities. Published in 2016, it categorizes the specific benefits of walkability, one of which is placemaking, into social, economic, environmental, and political benefits. In this easy-to-read, detailed, and beautifully assembled report, the reader can pretty much find any benefit of walkability, numbers for it, and the reasoning behind it. This report is the real deal. The 16 general areas of benefits from walkable cities, according to this report, each have their own icon and are presented in groups of four: social, economic, environmental, and political. Source. This map of the case study sites show the diverse range of topics the case studies cover and, although many of them are in western Europe as that is where the ARUP group is located, there are some on every populated continent. Source. If you are interested in the effects and statistics related to walkability and public places in cities or if you need a resource for a project or presentation, this document is for you! Get your copy here! “Today’s placemaking efforts celebrate and stabilize distinctiveness with modest-scale investments, a dramatic change in American economic development…In the new century, sponsors look beyond physical alterations, paying more attention to the animation of places with economic and cultural activity” (Gadwa and Markusen, p. 5). Most of you are probably aware of creative placemaking, how it has started in your community, and what you can do to make it grow. But in case you’re not or you just want a good placemaking resource, this document has everything you ever wanted to know about creative placemaking and a number of case studies to gain inspiration from! Prepared by Ann Markusen and Anne Gadwa, this resource will inspire you to start/increase creative placemaking activities in your area! Creative placemaking is becoming a more accepted–and fun!– way to spark interest in a community, invest in it, and increase economic development. Source. Want to know how the arts and culture benefit from creative placemaking? It’s in here. Curious about the outcomes of creative placemaking? Consult this resource. Interested in how to combat the challenges of creative placemaking? Yup, it’s here. Looking for how to fund your next creative placemaking endeavor? You guessed it! We have all heard about it: the cool, hip, green, tourist attraction in New York City: the High Line. The 1.45 mile long linear park transformed from a rail line attracts 300,000 visitors per year, more visitors than any other location in NYC. This attractive park has over 400 free public programs and more than 30 public art projects per year. The amenities of the High Line are incredible and diverse featuring views of the Hudson River, skyscrapers, parts of the rail line, artwork, access to food carts and more than 350 species of perennials, grasses, shrubs, vines, and trees. In addition to all this, the High Line will also generate around $1 billion in tax revenues for the city over 20 years. By all accounts this seems like a home run, slam dunk, touchdown for a park which runs through many parts of the Chelsea neighborhood in Manhattan, and in these ways it is. But there are some unintended consequences which have the designers and surrounding residents rethinking the High Line and how it could have been made better for those already living in the neighborhood. Many people enjoy the High Line during all times of the year. Source. 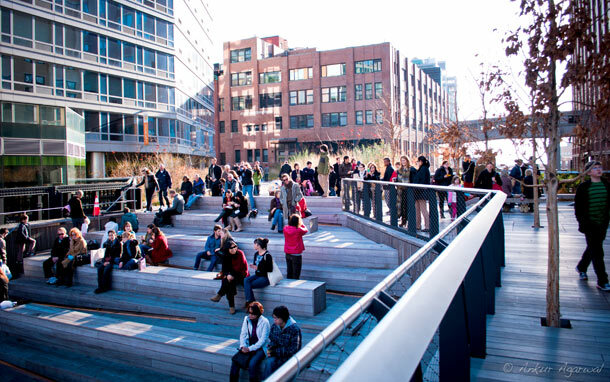 The High Line provides a green respite and place for activities for many visitors to the city. Source. So how can designers prepare for this? Is it possible to plan for every aspect of a project and what might happen in multiple different scenarios? So what is the High Line doing now to correct these oversights? The Friends of the High Line is the non-profit organization which is continually working to improve the High Line in a variety of ways and to raise money to pay for these improvements and programming. They have launched several initiatives including job-training programs for teens, education for kids, and working specifically with the public housing projects to develop programming specifically for their residents—one in particular called ¡ARRIBA!, summer Latin dance parties, are very popular. They do realize there are some things which could have been done at the beginning which are impossible to go back and correct, especially advocating for public housing. Other similar projects in Washington D.C., L.A. and Atlanta, are learning from these unintended consequences in NYC’s project, but will almost certainly have unintended consequences in their own projects. In the end, that might be the best anyone can do—set out with a good idea, consult the public, build the project. But to not leave it there—don’t walk away and think it’s done. Continue to assess the project, evaluate what worked and what didn’t, and change what needs to be changed. The world is evolving, humans are evolving, jobs and housing preferences are evolving, shouldn’t the public amenities which go along with them? Read the full story on the High Line and public housing here. Interesting Reads: Can Vacant Buildings and the Arts Help Save Small Towns? Nearly ten years ago, New York native and “arts and cultural evangelist” Zach Mannheimer chose Des Moines, Iowa as his entrepreneurial pet project. Soon after his arrival, he helped rejuvenate the Des Moines Fire Department Headquarters, a 1937 Art Moderne building built with the aid of the Depression-Era Public Works Administration, into the Des Moines Social Club, a non-profit, mixed-use arts hub.